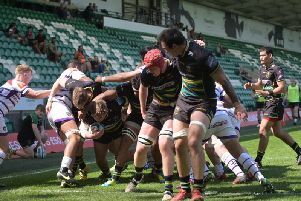 The Wanderers are on the brink of an Aviva A League home semi-final after seeing off Sale Jets on Monday night. A strong Saints second string took the the field at Heywood Road and the game was to end in a convincing 34-10 victory for the away side. Ben Nutley (2), Rory Hutchinson, Tom Kessell and Tom Collins were all on the scoresheet, with JJ Hanrahan adding a penalty and a conversion and Sam Olver adding the extras to two tries. The result means the Wanderers will finish top of the Northern Conference if they are able to beat Worcester Cavaliers. With Saints currently enjoying such strength in depth, it was to be one-way traffic at Sale. The Jets, who lost in a friendly at the Gardens at the end of last month, were hampered by an early sin-binning, with James Flynn seeing yellow. Hanrahan landed the resulting penalty and the Wanderers scored their first try on 20 minutes as Ben Nutley dotted down. Hutchinson was next to score, making the most of some fine work from speedy wing Collins. Hanrahan converted, but the Jets were to respond before the break as Viliami Fihaki powered over. Sale scored again after the break, but the Wanderers took the game away from them with three more tries, from Kessell, Nutley and Collins. An Olver conversion a minute from time put the icing on the cake. Wanderers: Wilson; Collins, Hutchinson, Olver, Elliott (Packman 66); Hanrahan (Furbank 62), Kessell (Duchesne 72); E Waller (Beesley 72), Marshall (Fish 54), Denman (Parkins 62); Moon (Peters 62), Onojaife; Williams, Nutley, Bennett.